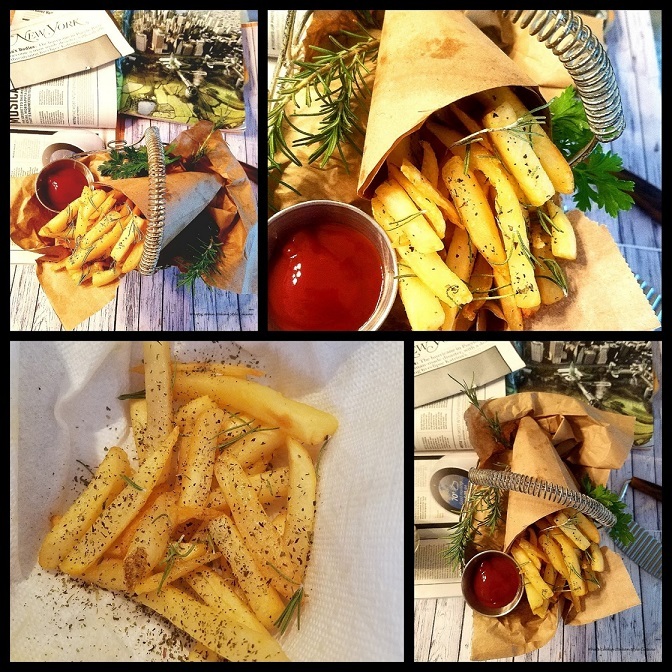 Italian fries are a crisp french fried potato bursting with a flavorful amount of herbs and Italian cheesy spices! An American Italian take on what is known for a fast french fry. What makes them seem Italian is all the seasoning. They're all seasoned up with Italian herbs, fried to perfection with spices and Italian cheeses. 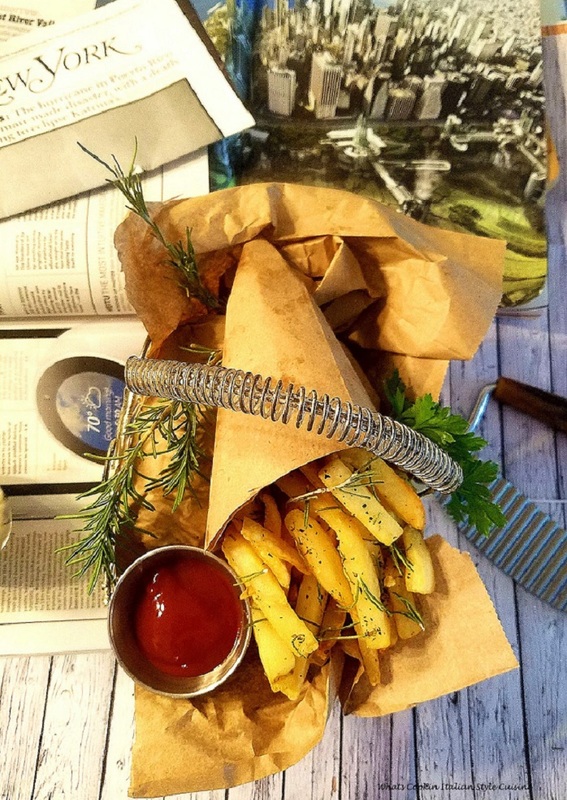 These Italian Fries are so delicious and a perfect fix to any french fry lover. Italian style french fried potatoes gone wild! I love them with any dinner we serve but we can eat them as just a snack for lunch, in between meals and of course with a tasty Italian burger! When I grew up in an all Italian household, everything had garlic in it! The hamburgers tasted like a meatball and the fries were seasoned with herbs and spices. It's hard to become Americanized to making them like a fast food chain. These fries are what we grew up on and still, make. French Fries are a classic universal favorite! I see in many restaurants they come in all different shapes now. Potatoes are so versatile when it comes to shapes. My family loves the shoestring style or medium. We love them loaded also with melted mozzarella and a little marinara on them and if you want to make a whole meal out of them add some cooked loose sausage and peppers on top first! Whether it's with a burger or any meat or for just a snack, these are a delicious side dish. 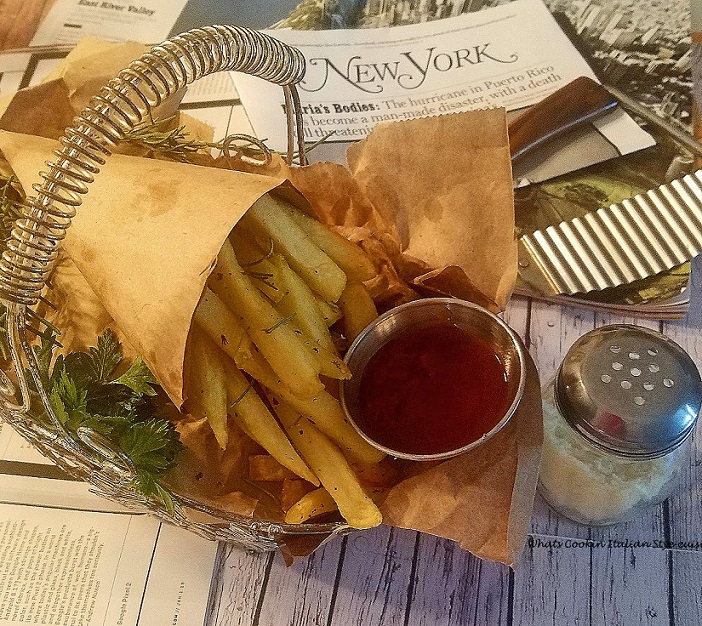 I just love the change in flavors with the Italian herbs and spices, dipped in a marinara sauce instead of ketchup really make them Italian Fries! These Italian French Fries are quite different in flavor since they have so many herbs and spices on them. I really love the fresh herbs they bring out the flavors in the Italian fried potatoes and virtually need nothing else, not even a condiment. I do add them on the sides. Believe it or not, my favorite to dip these in is vinegar. My son loves marinara sauce. My husband ketchup and many like to dip in ranch or blue cheese dressing. Any way you decide to dress these up they are outstanding with any meal. I love using my new air fryer. I lightly coat my raw potatoes with and oi spray and then air fry them until golden and crispy. If you love them deep fried in oil make them on top of the stove, electric deep fryer if you have one. One other way I have made them is thickly cut Italian Steak fries, brushed with oil and bake them. Season them when they come out the same way. Basically, they are delicious however thickness you cook them. The seasoning is what makes them super special. 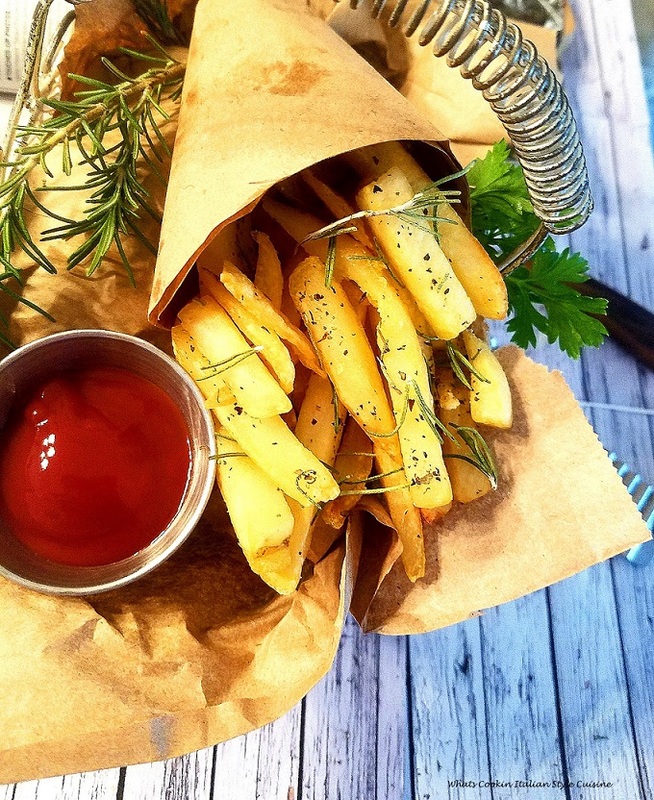 Either way, you make them homemade from raw potato or frozen, these fries everyone will love them. However, I highly recommend these, to get the full experience homemade version only. 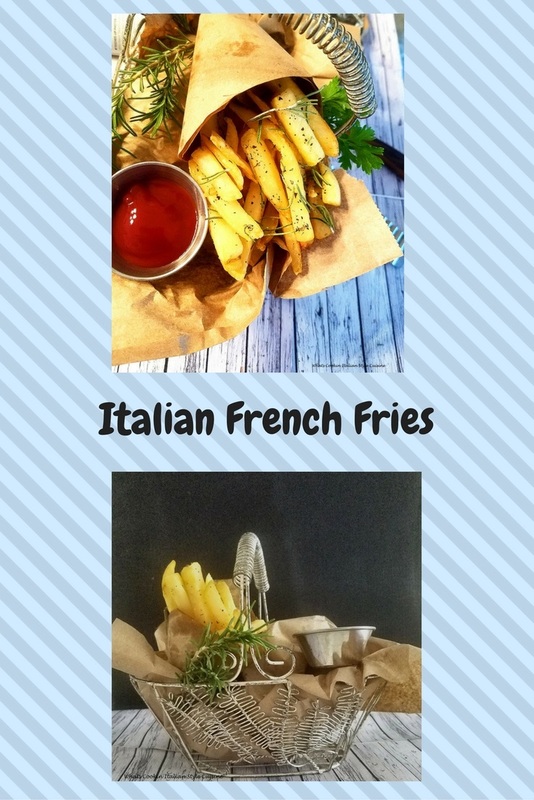 These fries are a great side dish addition to any meal and of course, they especially compliment my Italian style hamburgers! I even make these as a snack sometimes. 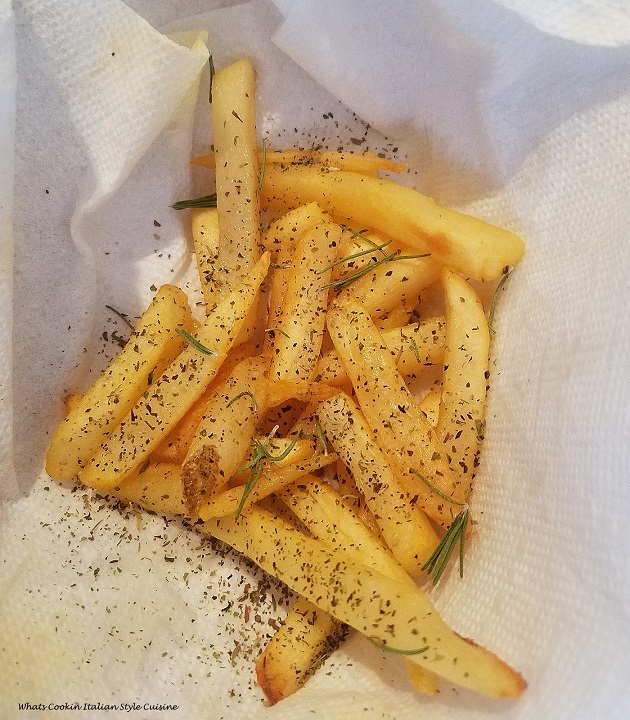 My grandson is a very picky eater but he loves french fries so I make these often without seasoning too heavy. Just cheese and parsley with salt, pepper. He loves his thin cut fries. Also, most of us love sprinkling some red pepper flakes on ours, then dipping them in marinara sauce. The nice part about making seasoned fries and Italian style is, how bold the flavors could be made to your liking. There are no rules here. Sprinkle away! You add as much or less of what you like or any of the ingredients listed. I say start out with a little instead of a lot then you can improvise accordingly. It's hard to remove over seasoning. We like more cheese than garlic so I use around 1/4 cup of grated cheese on mine and 1/2 teaspoon of garlic. We also like oregano better than basil, so I use less basil. Once you have slightly cooled them, then I add the spices while warm. Usually, the fries are so hot I can't handle them right away so like them cool slightly or pour them straight into a paper bag and shake the seasoning is the easiest way..
Everyone likes to dip them in something different here. One likes marinara, another hot sauce, my son likes mayo then the husband likes blue cheese. Whatever you like, dip away! They are great by themselves! These go perfectly with my Best Italian Juicy Hamburger recipe! These are a great side dish with any meal. The potatoes are fried and seasoned with Italian spices and herbs. Cut the potatoes into 4 to 5 vertical slices then into sticks or other shapes you like. Deep fry the french fries in 300-degree oil (or in an air fryer if you have one to manufacturer instructions.) It takes around 25 minutes or more to brown. If using frozen, check the package instructions for times. In a large bowl or paper bag place the fries in with all seasoning to taste, stir or shake gently to coat. Sprinkle with cheese to your taste, red pepper flakes if using and more garlic if you like. Salt, pepper to taste. Serve hot with your favorite marinara sauceor condiments for dipping. Optional: to make loaded potato fries: add shredded mozzarella and cooked loose sausage on top and fried long hots. 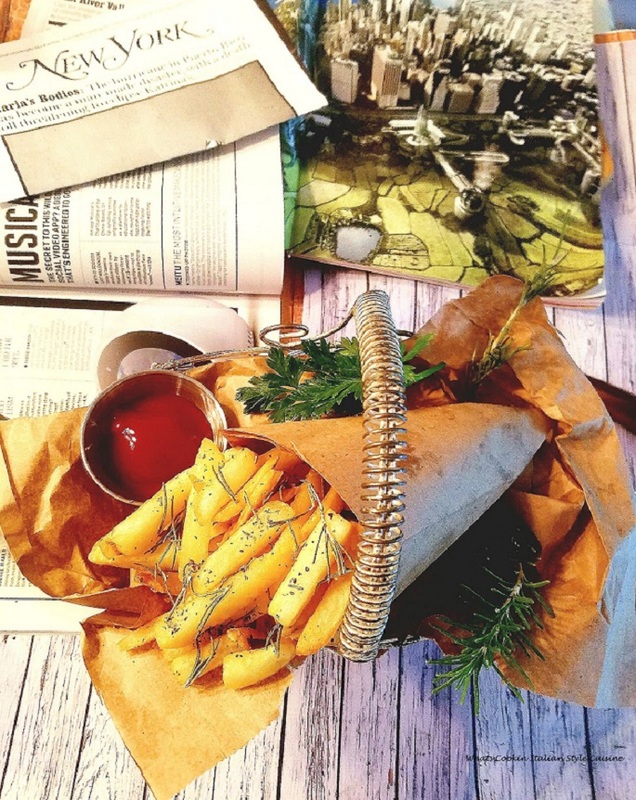 Don't forget to make these fries with our Italian Burger Recipe! They look very crunchy! For me, with lots of garlic, please! My family loves ALL kinds of potatoes, but especially French fries. Your Italian twist sounds irresistible! I could eat these all day long. I have a serious weakness for french fries. I really like this recipe! And how simple and short the ingredient list is. I think this is an ideal appetizer! Thanks for the great recipe! Yum! I love that you added Parmesan and Romano! I bet they make these fries taste so delicious. My mom is so obsessed with the air fryer but I have yet to try it. But you’ve convinced me to give it a shot! These fries sound delicious, especially with the cheese! French fries are the best! I love all the flavors you chose for this recipe. Would like to try it. I haven't made french fries at home in such a long time. I'll have to try your Italian version - I love fresh herbs on anything! I love making my own fries at home. These look great! I love the twist of Italian style! I can't wait to try these with your juicy burger recipe! The fries look so good and I love them with the herbs and a little marinara sauce. Can you get any better than a big basket of fries? These will be on my list next time I make burgers for sure. I would like a bucket of these please!!!!!! Seriously a whole bucket!! As far as I'm concerned, french fries are the perfect food. Thanks for sharing! These fries are the bomb! My kiddo would love these crunchy fries as an afternoon snack. I've yet to meet a person who doesn't like French fries! I like my plain without dunking them in anything. I love any kind of Italian seasoning so these fries would certainly be a favorite with me. These sound so flavorful! I love french fries, but sometimes I want to change them up a bit. These look great! I am a potato freak so I absolutely love this recipe. Beautifully seasoned with all the classic Italian herbs, these look crispy and so flavorful. Love the addition of herbs and cheese in french fries, If I made this my house it will be finished in hour. My dad and I used to make fries almost every weekend! These look so delicious!